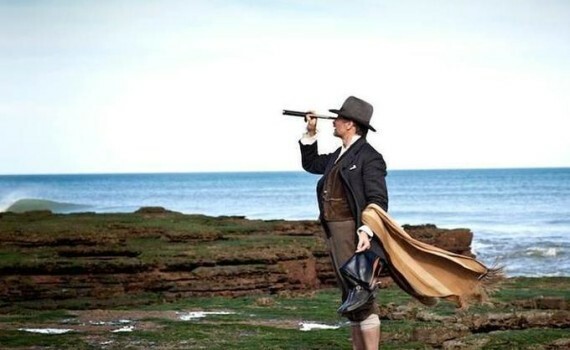 Call it absurd, surreal, whatever you want, Jauja still doesn’t make any sense. Ever since Waiting for Godot & Rosencrantz and Guildenstern Are Dead I’ve had a grudging respect for ridiculous stories whose depth is the only thing keeping them interesting. But while those books from high school English class were fun and chatty, if a bit insane, Jauja is quiet to the point of lunacy. It weaves a weird tale, delays every scene, and ends up as absurd as its brethren, but never excites or amuses in the way we’ve come to expect from surrealism. Why not? Who knows. In a desert far from home, a Danish surveying captain and his daughter travel with a small group of soldiers across a rugged landscape, on some unknown mission. The locals, or coconut heads, are up to no good as usual, and even the soldiers’ commander has begun acting strangely, leading a group of them across the land, followed by his dog, dressing as a woman. Well, that’s odd, but things get even weirder when the captain’s daughter runs away with a soldier into the wilderness. He’s off after her, into God knows where, and good luck getting back alive. That description actually makes the movie sound a little interesting, but I assure you that it is not. That’s the plot, but that doesn’t account for 90% of the film when nothing whatsoever is happening. Every scene lasts longer than it should, intentionally, and the pace is so odd that it begins to melt your brain. That’s not to say it’s all terrible; there are some beautiful shots, stunning colors, and the concept it just crazy enough to be captivating. But while other surrealist films go wild, this one tones everything down, leaving us with a story that has no definable end, but not one that amuses or elevates with its purposelessness. Viggo speaks Dutch, Spanish, chases a girl around a desert, talks to a man who just masturbated in a tide pool; not a bit of sense is made, and while I wanted to attempt to like this unique film, I just couldn’t.